Some people just know how to do things right. 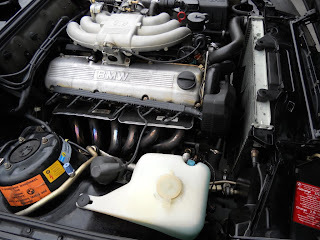 This slightly modified 325i was done right. This is a 1989 325i. By the time this car was built the "eta" version of the engine was gone, as were the aluminum "diving board" bumpers. The car performed and looked great. 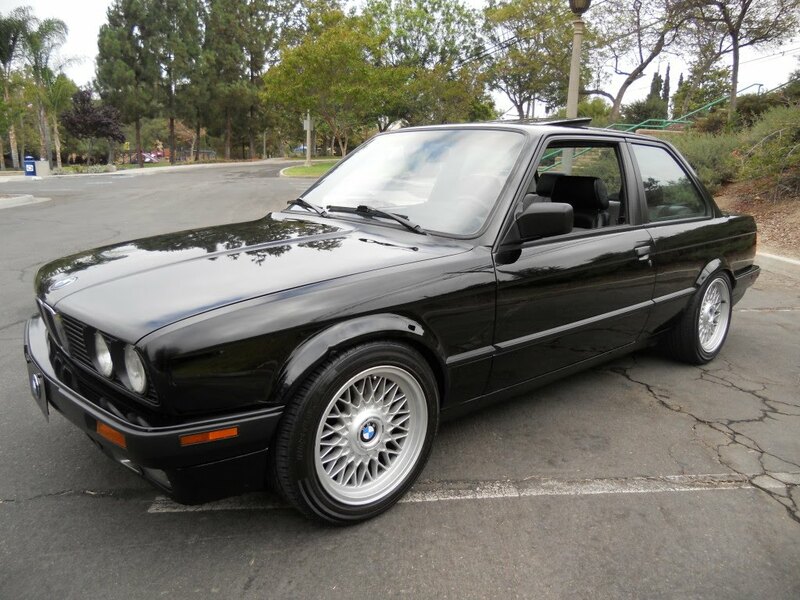 This car is owned by an "E30 enthusiast". He obviously knows his stuff and modified the car, but didn't over modify it. Everything done to this car is simple and effective. The engine is the original engine but the owner put on a header and the injectors are from a 1995 325is. He also chipped the computer. The wheels are from a 2000 740i. They have been redrilled to match the E30 bolt pattern. Suspension Techniques Speedtech lowering springs were used to lower the car 2.4" in the front and 2.0 in the back. The the rear fender lips are rolled, but the seller admits that the tires occasionally "rub just a tiny bit if you have passengers in the back or accelerate full throttle". Raising the car back up an inch (or less) would most likely cure that without changing the aggressive, lowered look of the car. 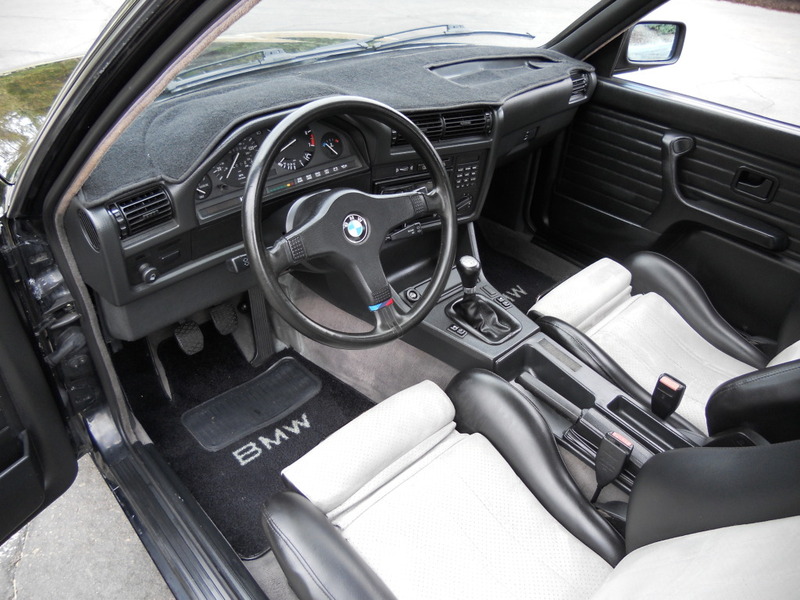 On the inside he added a set of optional (in Europe only) Recaro seats and rear headrests. He had all the seats recovered so the upholstery matches. Everything else on the car is basically stock and / or original. There are no spoilers, sparkly paint (the paint is original), air dams or other unneeded add-ons. This is a modified car an adult could drive. It's perfect. This is a no reserve auction. Click here to see the eBay listing. It is puzzling that it has a fairly recent CA plate, but it couldn't have been issued that plate without the catalytic converter. Bureau of Automotive Repair records show it passed a smog test in February. Perhaps the CAT was removed since then, or else there was a shady test station. BAR also says it is a 1984 model, but I'm guessing that's an outright error. Worth checking where the car was before February, though. Either came from out of California or was salvaged or for some other reason received a brand new CA license. Thanks for the info! I don't know / understand all of the license plate nuances in CA. Here in MA the plate stays with the owner and can get transferred from car to car. You still see the old "green plates" (last issued in 1987) on new 2010 cars. This would probably not be a great car for someone in CA to buy. But, if you live in a state like MA where pre-1995 are not smog tested, it might be a great buy. Wow. I was just searching through e30 images on google when I see a picture of one that looks exactly like mine. Click on it, land on this blog and it is mine! I won the ebay auction labor day 2010 and had the car shipped to MA (where I live). The car is in excellent shape. Only thing I did was replace the coil springs with H&R's which raise it up about an inch. Can't risk dumping an oil pan on these new england roads. 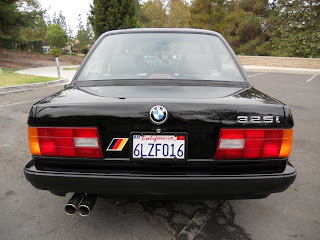 I rarely inform a seller that I'm writing a post about his or her car. (The few times I have it was because I wanted more info - This eBay ad was so comprehensive that I had no need to contact the seller.) I doubt that he knew I wrote about the car. Of all the cars I've written about, this is still one of my favorites. I'm glad to hear that it was everything the seller described it as being. So just curious, what did it sell for? Auction listing has expired.